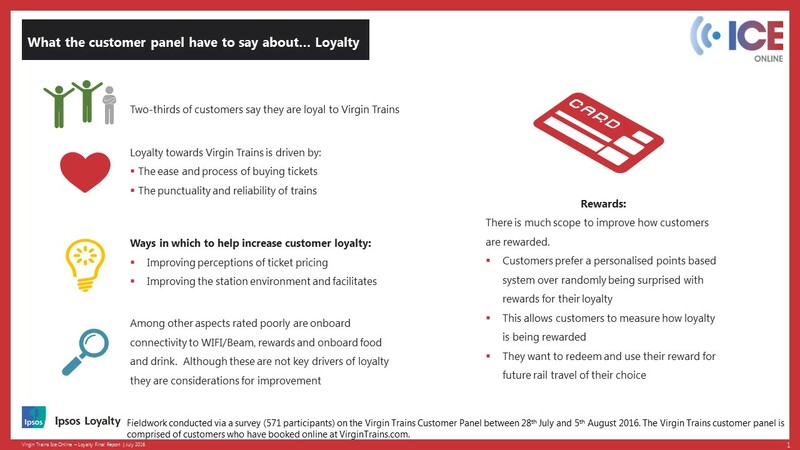 Recently Virgin Trains West Coast conducted a survey with their customer panel between 28 July and 5 August asking for their views on loyalty. Although two thirds of the customer panel considered themselves loyal to Virgin Trains they considered rewards as one of the things that rated poorly. Rewards on Virgin Trains West Coast include Nectar and Virgin Atlantic Flying Club, they also have 'Traveller' which is a good scheme for very high value customers but only benefits a few and so it's likely most members of the panel are not eligible for this scheme. It has to be remembered that Virgin Trains West Coast never had a loyalty scheme that was in any way comparable to East Coast Rewards. Before Virgin Trains West Coast introduced Nectar there was only the Flying Club option available. So even on the West Coast, where Nectar was providing an additional benefit, it was still considered disappointing. There is much scope to improve how customers are rewarded. Customers prefer a personalised points based system over randomly being surprised with rewards for their loyalty. This allows customers to measure how loyalty is being rewarded. They want to redeem and use their reward for future rail travel of their choice. Our conclusion is that we had, on the East Coast, a scheme that met all these requirements before Virgin Trains East Coast took over and replaced it with Nectar. If Virgin had continued the East Coast Rewards programme and expanded it to the West Coast they would have maintained a class leading loyalty scheme that gives customers what they want in order to feel rewarded. It's clear that Nectar is not really a driver in encouraging loyalty. At Save East Coast Rewards we often monitor social media to see customers views on the Nectar scheme and there's very little enthusiasm shown with customers of any of the rail operators use Nectar. Those who collect Nectar points are generally only doing so because it's better than nothing but it won't tend to influence spending decisions. Virgin Trains West Coast also added the ability to collect Nectar points from their FastTicket machines. After a bit of customer monitoring at Euston station it was clear that customers found getting asked for their Nectar card when they weren't expecting it to be very frustrating. Shortly after their introduction Virgin Trains added signs to the FastTicket machines explaining how to skip being asked for your Nectar card. For those of you who weren't familiar with East Coast Rewards, see how it compares with Nectar here. As you can see it's clear why East Coast customers were angry when Virgin scrapped the scheme and replaced it with Nectar. We're glad that customers on Virgin Trains West Coast agree with us that Nectar is in no way an incentive. The survey also said onboard food and drink also was poor and didn't help with loyalty. It's unclear whether most respondents travel first or standard class.